A recent episode of Futurama – ‘A clockwork Origin‘ – sees the Professor go head to head with Creationists, and makes a good point about the difference between Creationism and Evolution. After his work on the origin of man is mocked, the Professor decides to leave Earth for a desolate planet. However, the nano-bots which he designs to purify the water evolve overnight into a full-scale ecosystem, complete with robo-dinosaurs that are eventually wiped out by a solar flare. At first, the Professor is unwilling to see the change in the robots as Evolution, saying ‘Those robots didn’t evolve by themselves, I put them there – I’m a genius, get over it’. However, after the crew is captured by robo-anthropologists (anthrobopologists? ), he’s forced to admit that they really have Evolved. Further, he’s forced to admit that he has no problem with the idea of a creator playing a small part in the origins of Humans, just as he started the race of robots. This is all good news for those studying Cultural Evolution – people are coming round to the idea that Evolution is an abstract process rather than the theory of how humans evolved from apes. 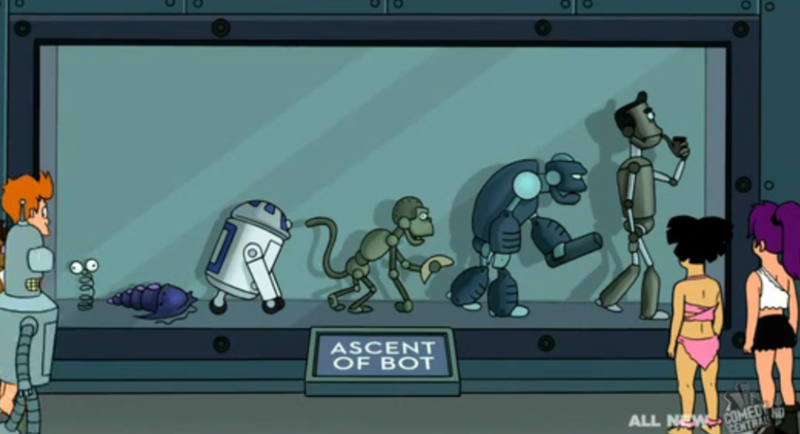 Perhaps us researchers will be spared in the robot uprising, which is sure to come: As Bender says “Robots do everything faster, including evolving”.